Contractor Bonds in Lakewood, WA - Alliance West Insurance Inc.
We offer a variety of contractor bonds including License Bonds, Bid Bonds, Performance Bonds, Payment Bonds, Maintenance Bonds, Site Improvement Bonds, Subdivision Bonds, Supply Bonds and Right of Way Bonds to name a few. When you purchase contractor bonds from Alliance West Insurance, Inc., you gain the peace of mind of knowing that you are bonded by a company that will stand by you and protect you when unwarranted claims are filed against your bond. For more information, please see below. A contractor license bond is a type of license and permit bond. Contractors must purchase these bonds before they can receive their contractors license to ensure contractors follow all applicable licensing laws and regulations. General Contractors must file a contractor’s bond in the amount of $12,000, Specialty Contractors must file in the amount of $6,000, and Electrical Contractors must file in the amount of $4,000. Unlike Contractor License Bonds, Contract Bonds cover a contractor for a particular project and are sold on that basis. Brief summaries of each of the different type of contract bonds are listed below with the most common ones listed first. Bid bonds reassure project developers that contractors submit serious bid proposals and have the financial credentials necessary to accept the job. If a bid is selected and the contractor declines the job or retracts the bid, the project developer can make a claim on the bond to collect the difference of the original bid and the next highest bid. Performance bonds guarantee that contractors complete construction projects according to the contractual terms. If a contractor fails to do so, the project developer can make a claim on the bond to access funds that can be used to pay another contractor to finish the job. The Federal Miller Act requires that performance bonds be used on all federally funded projects worth $100,000 or more. Performance bond insurance premiums vary for a number of reasons. Factors that affect the cost of performance bonds include the construction job’s projected cost, the contractor’s financial history, and the jurisdiction in which the performance bond will be issued. 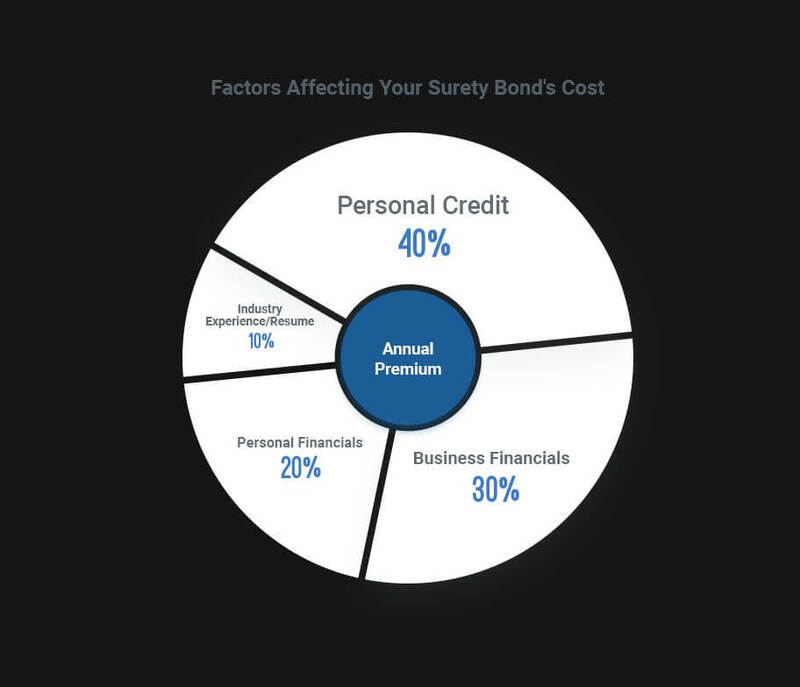 Most small, infrequent users of surety credit will pay 2.5% to 3%. Larger, established contractors can obtain bonds at rates starting at 1%. Payment bonds guarantee that the contractor will pay financial obligations for labor and materials, including those from subcontractors and suppliers, which are associated with the contract. The bond amount can be used to reimburse those who worked on a project if the lead contractor is unable to pay them for their work. Maintenance bonds protect against defective materials and workmanship following a project’s completion. If the project is found to be defective following completion, the bond amount can be used to pay for repairs that need to be made. A right of way bond may be required if you want to conduct work on public highways and roads, or similar public spaces. It is one of the criteria for obtaining a right of way permit. Site improvement bonds guarantee the completion of certain renovations and/or improvements made to projects, properties or structures. Subdivision bonds require contractors to build and/or renovate public structures within subdivisions – such as streets, sidewalks and waste management systems – according to local specifications. If a contractor fails to do so, the bond amount can be used to complete the subdivision project appropriately. Supply bonds mandate suppliers to provide materials, equipment and supplies as defined in purchase orders. If the supplier fails to provide the supplies as agreed, the bond amount can be used to reimburse the purchaser for the resulting loss.